Rush Hour follows the daily work commute of people in three of the world’s most congested cities: Estela in Mexico City, Meltem in Istanbul, and Mike in Los Angeles. Each story offers a unique perspective on the problem—but all point to a similar solution: reducing economic inequality. In Istanbul, Kaplan followed the daily commute of Meltem, a Turkish mother of two who worked in a clothing store on the other side of the Bosporus strait. Istanbul is both a cosmopolitan city and “a very traditional society, where a woman still finds it difficult to go out and work,” said Kaplan. During the 1960s, Mexico City “saw the start of a major expansion towards the periphery as a result of the proliferation of irregular settlements inhabited by poor migrants arriving in the city,” said Martha Schteingart, Professor-Researcher at El Colegio de Mexico in Mexico City. Today, a high percentage of poor families live in peripheral districts like Estela. But more than 70 percent of the jobs are concentrated in Mexico City proper, creating two opposing trends: a decentralization of residents and a strong concentration of jobs, thus lengthening commutes. Why don’t victims of long commutes simply change jobs? Kaplan believes this is an unfair question. In the film, for example, Meltem says she would like to have a better job, but she simply does not have the time to look for one. In many cities, real estate in the central districts where employment is concentrated tends to be more expensive, while jobs in other areas usually offer lower salaries. Although their commutes were very different, all three subjects in the film lived in areas with more affordable housing but traveled long distances to better-paying jobs. Efforts to shorten long commutes should not rely solely on transportation policies, said Schteingart, but should also seek to address the unequal social structures that help create them. “The minimum wage issue has become a problem because no one can afford to live in the communities where the jobs are, so they’re being forced further and further out,” said William Chernicoff, Senior Manager at the Toyota Mobility Foundation. In addition, policy solutions designed to improve public transportation can sometimes have unforeseen consequences. Efforts to formalize transit systems in Central and South America, for example, have sometimes come at the expense of the informal systems that serve lower-income residents, said Chernicoff. Rather than being merely a transportation issue, long commutes are a reflection of economic inequality. “It’s all based on a system that is very unfair, very savage,” said Kaplan. “How can we expect a person with no education, or who is a single mother, to receive the same opportunities? It is impossible to compete,” she said, adding that nothing would change without a substantial change in the economic system. This post was based on the panel discussion at the Wilson Center and additional information from an interview with Luciana Kaplan following the event. Some statements have been translated from Spanish. 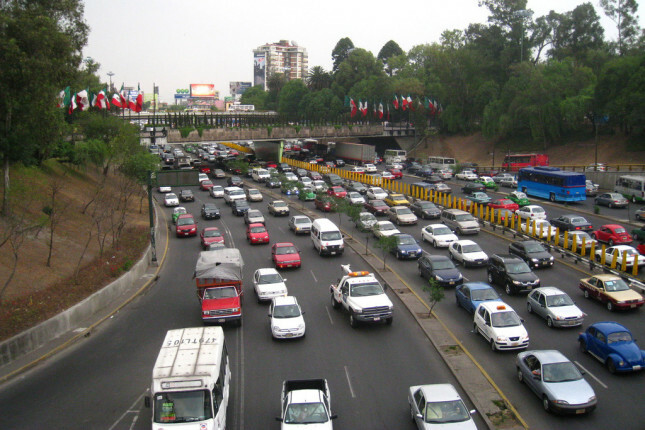 Photo Credit: Mexico City traffic, April 2008, courtesy of Colin Knowles.